Holy water (Theertham) : Saptha Sagaram. Sacred Tree (Sthala Vriksham) : Karu Oomathai. Timings : 06:30 a.m. to 01:30 p.m. and from 03:30 p.m. to 08:30 p.m. This is the 25th sthalam on the northern side of river Cauvery. This temple has got the Thiru Ganasambandar and Appar Devara Pathikam. It is firmly believed even today that those men and women whose marriages are getting delayed due to various circumstances, will soon get married if they come to this Sthalam and worship God Shiva. 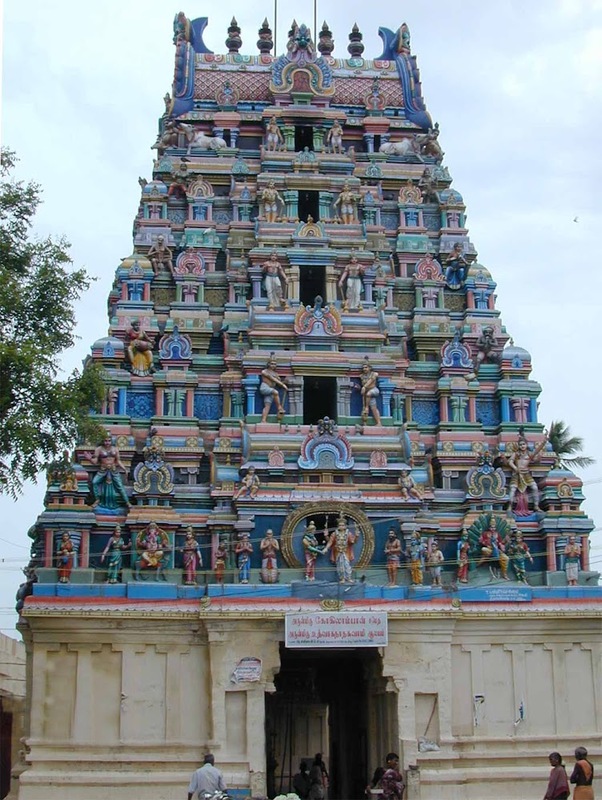 Manmadhan is believed to have worshiped God Shiva at this sthalam. The shrine of Thirumananjeri is closely associated with legends that tell the story of Shiva's marriage to Parvati. The temple is crowded at all times of the year, showing the importance of marriage in our community. One is supposed to offer special prayers to the lord, after which we are given the garlands worn by the god and goddess. We are supposed to keep this carefully till we get married, and then after the marriage, come back to the temple with one’s spouse, wearing the same garlands, and once again offer prayers as thanksgiving. 3 day Chithirai wedding festival of Lord is grandly celebrated in April-May on the Poosam star day when the whole place will be in a wedding mood. The devotee crowd in the temple is huge on Pradosha days each month, Aadi Pooram in July-August, Tiruvadhirai in December-January and Tirukarthikai in November-December are other festivals celebrated in the temple. Special pujas are performed on Deepavali in October-November, Pongal almost falling on January 14 and Tamil New Year day falling almost on April 14. It is a holy place where the God and Goddes weds. Goddess Arulmigu Kokilambal born as a cow due to the curse of God Uthvaganathasamy. The cow then born as a daughter of saint Bharatwaja Rishi by worship the God Uthvaganathar. Then she chosen the Lord as her husband and got married as per the local ceremonies and formalities in this place. They have not set eyes on each other but they had set their hearts union. The both present themselves as divine couples, stand with monarc on the south side of the temple, and blessing the devotees. The unmarried bribe and groom devotees who pray the divine couples for the arrangement of their marriage and the same will be settled by the Divine couples at an earliest possible by removing the obstructions which causes for the delayed marriage. The Lord Kalyanasundarar stands as bridegroom and blessing the devotees. The Goddess Kokilambal seen the foot steps of the Lord by bowing her head with shyness. We can see such as glorious scenes only at this place. And also the Lord gave 'Mangalya Pichai' to the 'Rathi Devi' and combined the both 'Manmathan and Rathi Devi' in this place. The Durgai Amman stands in the north side of the Goddess Kokilambal facing north direction. And the 'Raghu Bhagavan' who gave graces for the birth of child stands in the left side. It is an eye faced truth that the devotees who pray the Lord by offering garlands to the divine couples for wedding ambition the eternal couples bless the devotees with grace to attain their ambition with in a short period after their prayers. After marriage the married couples should come once again to this place and complete their prayer by worshiping the Lord Kalyanasundarar. The married couples who were separated from their married life for various reasons may also come and pray the Lord Kalyanasundara for their unity. This kind of prayer is also conducted in this temple. Every month during New moon day(Amavasai) only in front of 'Raghu Bhagavan' sanctum from morning 8 a.m To 1 p.m. prayers will be conducted for the birth of a child to the married couples. The married couples to the present on the auspicious day by offering garlands to the 'Raghu Bhagavan' and should take part in the prayer for the fulfillment of their ambition. In this temple there is no 'Raghu Kalam', Emagandam, Ashtami and Navami thithis. In all days the devotees may take part in the devotional prayers. After leaving Kattagopuram Varasihi Vinayagar bestow hiw good will infront of Vinayagar Shobana Manadpam. Inside the sanctum Arulmighy Sri Uthvaganathar (Arulvallanathat) bestows his Goodwill in a beautiful manner in Thuvara Mandapam with Thuvara Balagar and Nandhi. In Niruththa Mandapam Sherr Natarajar Bestows his goodwill in a dancing exposure. In front of Natarajar in the south Praharam Lord Kalyanasundarar stands by embodied the Goddess Ambigai with a laughing expose facing east. The Kalyana Sundarar is the king of monarc and Hero of Lord in the temple. After getting their good wishes shree Kokilambal Ambigai Sitting in Suhasanam poisture as a bride in the wedding platform. It is a great feast to our eyes to look after and worship the Goddess. When we enter to the Inner Praharam we can see the sanctum of four dieties of Samayakkuravar's who propagate salvate in this country in front of the Natarajar Sabai. In the South side of the Devakushtam Pichadanar, Balaganapathi, Natarajar, Dakshinamoorthi in a yoga poisture were found. In the west side Lingothpavar, and in North side Brahman, RAghuBhagan and Sri Durga have been installed ina seperate sanctum. In the Kannaimoolai a beautiful Lord vinayagar sannadhi in the western side Karuvarai along with Upaya Nachiar Lord Mahavishnu, Lakshmi sannadhi and also the Idols of Baharatha Maharishi, Sembian Madevi, Mallappa Naicker were installed in the four directions of Karuvarai. 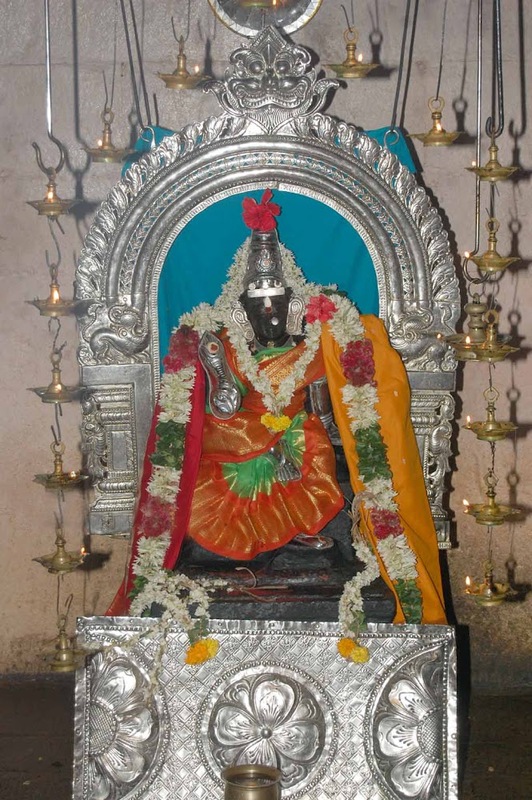 In the east Thirumalai row the following Idols were installed they are shree Saneeswara Bhagavanm Pachaiyappa Nathar, Rudravaneswarar, Pachaiammai and Nayagi Rudravaneswari. In general this temple is having so many immortal and rate deities to worship and pray for the grant of mercy and blessings of Lords for the Good will of devotees in all aspects in fulfill their ambition. For marriage parihara archana, for which you get a full set of items needed for pariharam including garlands. Unmarried spouse should buy one set of archanai thattu/bag; there are two places where you can buy this thattu; there are ten shops just outside the temple which sell this thattu for boys and for girls [manjal kayiru is added] containing 2 garlands, 2 coconuts, one lemon, vetrilai paaku, kalkandu; the same thattu is available inside the temple also at Govt (HR&CE Dept)-fixed price sold by an HR&CE employee; always buy it inside the temple in Tanjore temples; there is local politics in selling these thattu at double the price; the shopkeepers outside tell you that the ones available inside are ‘used’ ones which is NOT true according to the authorities and is just a marketing gimmick; HR&CE is unable to do anything about this practice since the shopkeepers have local support; one more alternative is to buy everything at Tanjore or Kumbakonam where you halt overnight; garlands also can be bought there since ALL types of flowers including December Poo are acceptable at Thirumananjeri; Rs.15-20 per garland should suffice since all garlands are collected and redistributed and most probably what you get will not be your own garland. Step-1: Go into the temple; you will see Selva Ganapathy on the left; pray him first. 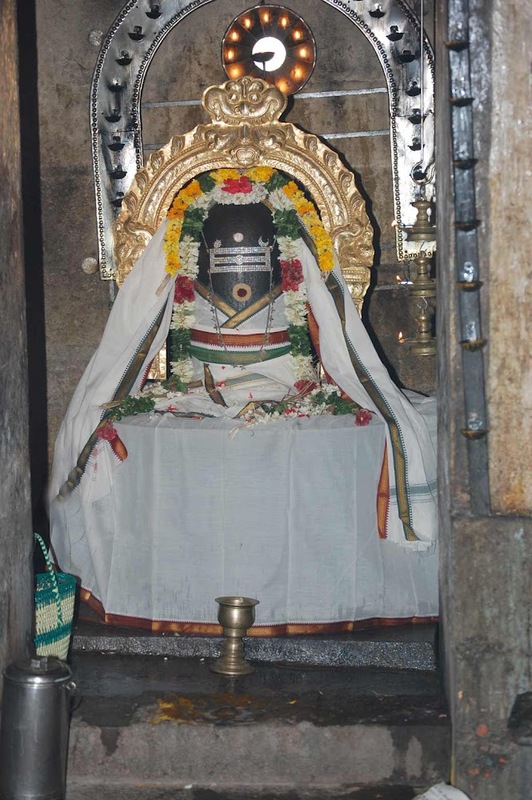 Step-2: Then pray Lord Shiva (Sri Uthvaganatha Swami) and go to (Parvathi) Amman Sannithi on the right. 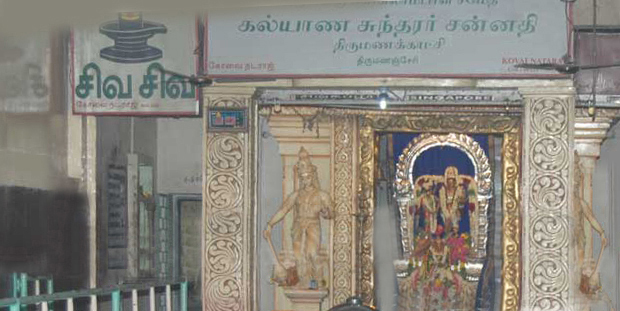 Meenakshi Amman here appears as a 13-year old Kokilambal, head slanted to her right, with three bends (“naanikkoni’). This posture is before her marriage. Step-3: On the left side of this huge Main mandapam is the most important Kalyana Sundareswarar Sannithi and Mandapam. Enter the mandapam and turn left; light the ghee deepams here, right opposite to the Kalyana Sundareswarar Sannithi (but do not light Raghu dosham’s deepams here; Mangala Raagu has a separate place for ghee dheepams); Kalyana Sundareswarar deities are in marriage kolam; Meenakshi is on his right looking at the floor in kalyana kolam; hence married girls should always stand on the right hand side of the groom during all auspicious functions; the priests perform the rituals here to remove our marriage obstacles. Details are given below. Step-4: As soon as you light the dheepams, wait for the next batch; only girls and boys concerned are seated inside the enclosure and those accompanying should sit around this enclosure; couples who come after marriage to complete the rituals (and the parents of boys/girls who are unable to come in person also can sit inside the enclosure; if you are parent(s) inform the priest as soon as you enter the enclosure). The priests brief you first regarding the Do’s and Don’ts; then collect all the garlands and the archana tickets first; they keep all garlands at the feet of the god, return one garland each to the spouse to be worn; [parents must keep it in their hands]; sangalpam is done and the thattu is taken away; [parents should tell the boy/girl’s gothram/name/star and not theirs]; archana follows, coconuts are broken, thattus are returned after aarthi as usual; drop Rs.10 or Rs.20 in the plate (thattu) for the priests. Step-5: After these rituals at the Kalyana sundareswarar sannithi, go and pray Shiva again. Normally no separate archana is done here. Full procedure for Puthira dosha pariharam: take bath in the thirukkulam nearby on amavasai day and take paal payasam for puthira bagyam; childless couple should offer ghee which is returned as prasadam which is to be taken at night for 48 days by the couple. Location: This temple is located 6 Kms from Kutthalam. Kutthalam is situated on the Mayiladuthurai - Kumbakonam bus route. Town bus services to Tirumananjeri is available from Mayiladuthurai. By engaging an auto at Kuththalam, one can visit all the 4 temples viz., Tiruthuruthi, Tiruvelvikudi, Tiruedhirkolpadi and Tirumananjeri easily within half a day.